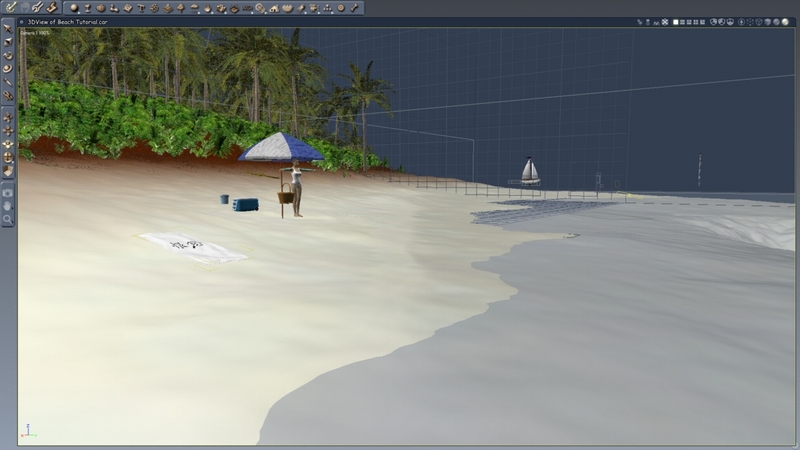 Last time I shaded the beach using a terrain shader, producing the sandy beach areas as well as the rich brown earth and dirt under the forest. I wasn’t entirely happy with how the sand appeared, but I think I have an idea about what may have gone wrong. I’ll get to that later, though. For now, it’s time to add more details! Image 1. Using fire to improve water? A while ago I saw a video on YouTube that showed a nice simple method to make a boat wake. 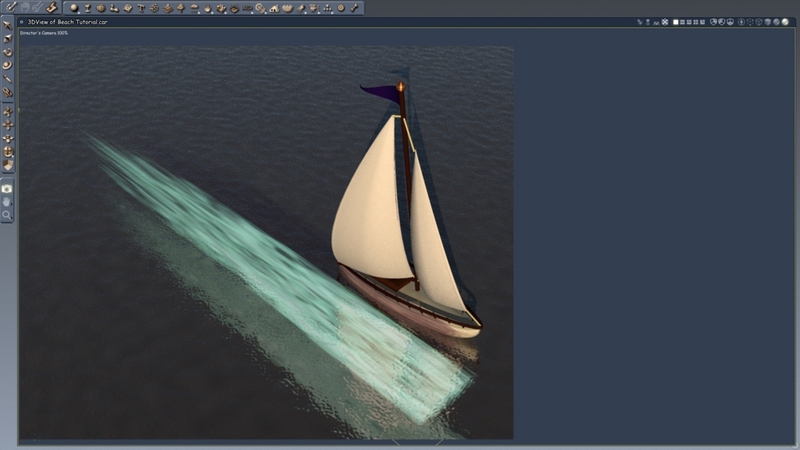 The boat in this image is the perfect opportunity to try out a new technique. 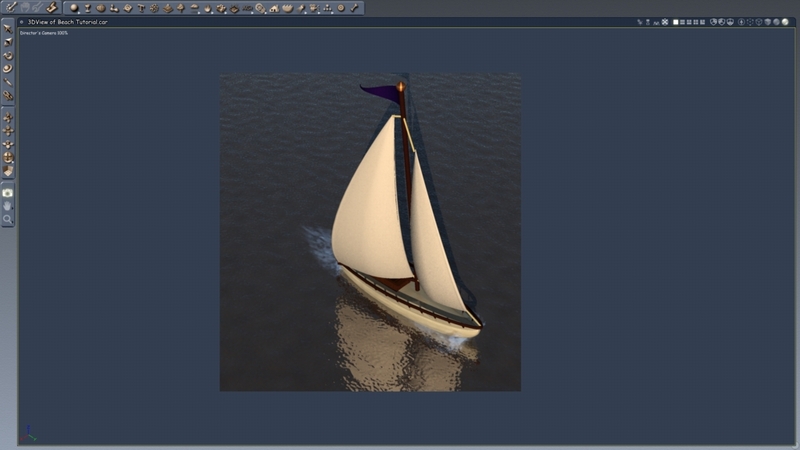 So today I’m going to start with the sailboat in the background. The technique actually uses Carrara’s built-in fire tool. The fire primitive doesn’t look like much in the assembly view, so I’ll do a spot render to show you what the fire looks like. It doesn’t look much like a boat wake, does it? Image 2. The wake is floating above the water so you can see the “fiery”-ness of it. What about now? I know it’s not in the correct place; I left the wake floating above the water so you could compare to what we had before. To make the fire look like a wake, I changed the colors from orange/red to white/blue. Then I turned the fire on its side, so that it points towards the back of the boat. I then flattened it and elongated it — after all, a wake is the disturbance due to the boat’s passing, so it should be confined to the water’s surface and extend out behind the boat. Image 3. This isn’t perfect, but it’s good enough. Tucking the new wake under the boat, I worked for about half an hour trying to match what I saw in the YouTube video. Finally, I realized that the author of the video had used twofire primitives: one for the bow shock and one for the trailing wake! 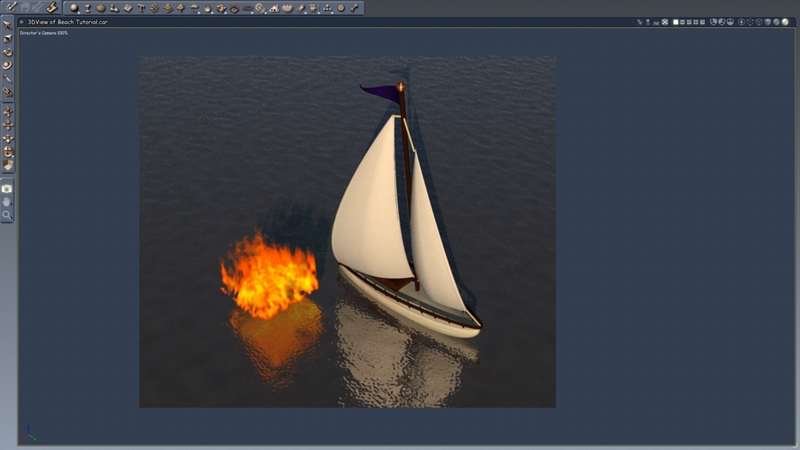 Duplicating the fire and tweaking the size of each lead to the spot render in Image 3. It’s not perfect, and if the subject of my image was this boat, I’d work on this a lot more. However, this boat is simply a distant background element of the scene; the problem areas of the wake won’t really be visible. However, the attention to detail will help the scene’s reality. Image 4. I’ve added the umbrella, a cooler, a picnic basket, and a bucket. Now I think I’m ready to move to the foreground elements. 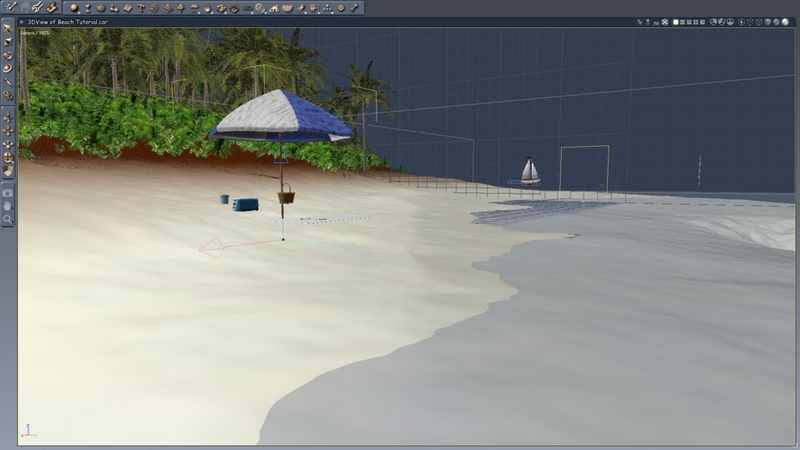 You may remember that I lost the fun elements of my scene due to a program crash. Now it’s time to try that again. First, however, I save the scene. No use making the same mistake all over again. Then, running through my library of items I grab some that I think might be useful. I don’t have the patience to go through as thoroughly as I did last time, so you’ll notice that I didn’t add the beach ball or the coconut. However, I find something interesting — a blanket that I can use as a beach towel! Last time I tried using a plane for that, which is what ultimately lead to the crash. This, however, should work, because it’s a mesh. I cross my fingers, load in the towel, and set it up for soft-body physics. As you can see above, this really helps make the towel look like it’s actually been thrown across the lumpy sand. (And in a way, it has.) The physics calculations can be rather intensive; calculation of just this one blanket took about five minutes. However, in the best case scenario I’ll only have to run the physics simulation once. Image 6. Here’s the render so far… but I see one small problem! This is a good saving and stopping point. I’ll move everything over to my nice wrinkled blanket, and render a final image to show our progress so far, and… Hmm. All of that detail work I put in the foreground is barely on the image! To fix that, I need to change the camera’s focus. That won’t take long, so I’ll do it now. First, let’s go ahead and acknowledge that the camera I’ve been using will likely be the final camera for the image. I’ll change the name to “Production Camera” to show that. You can see the name change in the image above. There’s also a white box on the assembly screen. That’s the production frame. It shows exactly what will show up in the final render. Notice that I’ve dragged it to the left so that my sunbather and other foreground elements are fully inside. This will make sure that they’re visible in the rendered image, unlike before. Our new “render so far” is looking good! Note that the sand doesn’t look as dark as it did before; I realized that was partly due to the angle of the light, so I raised the virtual Sun to a higher point in the sky, which let the bright sand show off more. The total time for this render was 1 minute and 18 seconds. This isn’t a huge increase from last time, which really emphasizes how much shading influences the render time compared to objects. Going forward, I think the sand and water could use some detail work, and of course our sunbather needs to get into an actual sunbathing pose! Once all the elements are in place it’ll be time to position the camera and invoke all the render details. But things are coming together!